Prototype: German State Railroad (DR) class 74 tank locomotive, type Omu Association Design gondola, type GR boxcar, Interchange Design, and German Federal Railroad (DB) type Rlmms 58 stake car temporarily used in the GDR. 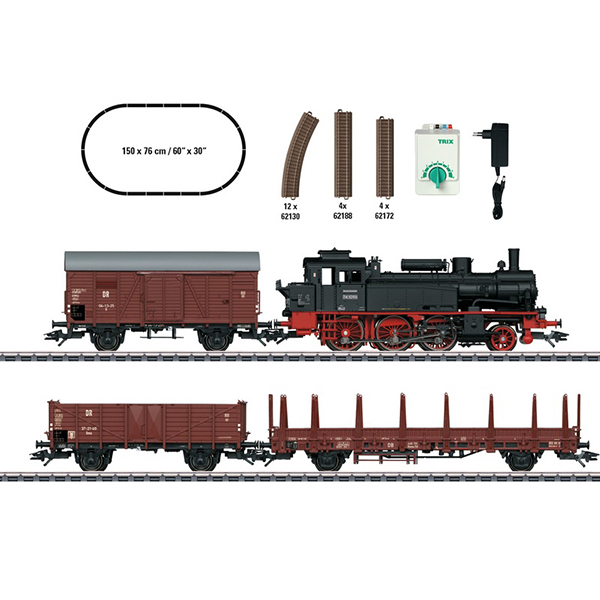 Model: The locomotive has a 21-pin digital interface connector and a special motor with a flywheel. 3 axles powered. Traction tires. The triple headlights change over with the direction of travel, will work in conventional operation, and can be controlled digitally. The cars have close couplers with guide mechanisms. Train length 51 cm / 20-1/16". Contents: 12 no. 62130 curved track, 4 no. 62188 straight track, 4 no. 62172 straight track. 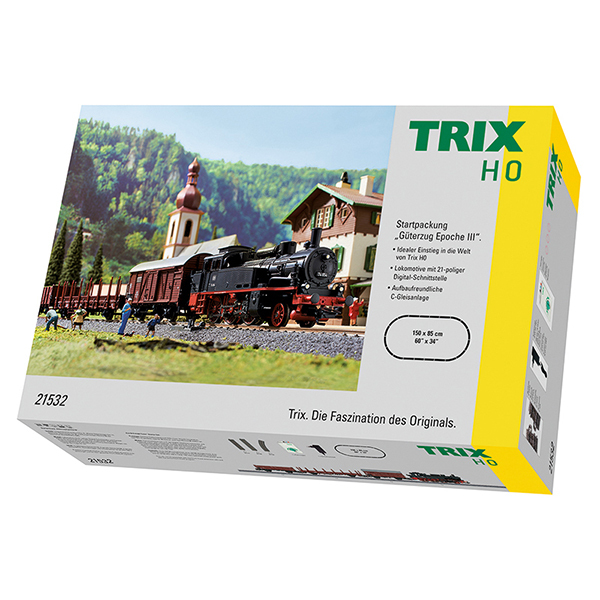 The set includes a Trix locomotive controller and an 18 VA / 230 volt switched mode power pack. This set can be expanded with the Trix C Track extension sets and with the entire Trix C Track program. Very easy set up thanks to Trix C Track. You can find the DB version under item number 21530. A digital starter set can be found under item number 21528.